I’m taking a quick breather week, I’ll be back again next week with the back half of Chapter 19. 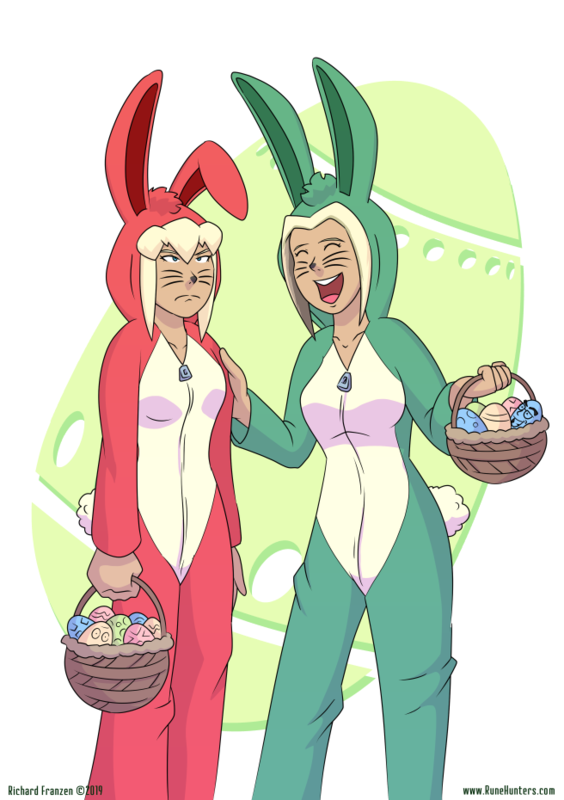 In the meantime, enjoy Ada and Alexis dressed up like bunnies. As you can see, Ada was one hundred percent on board with this idea. Hey folks, had a great time at Chibi Chibi Con yesterday. Plenty of nice people came up to the both, and lots grabbed flyers and copies of the comic. If you’re one of the new people here, let me say, “Welcome!” Also, be sure to go back and check out the comic from the beginning. Chapter 1 is right this way. Chibi Chibi Con 2019, again. Hey Rune Readers, just a reminder that I will have a table in the Artist Alley at Chibi Chibi Con 2019. The event will be on April 6th, 2019 and will be hosted at the Evergreen State College. Stop by and pay a visit if you’re in the area. Hopefully there won’t be a surprise snowstorm, again. As I said before, I will be selling copies of Rune Hunters Chapter 0, as well as some original artwork. Hey folks, just wanted to give you a heads up that Rune Hunters Chapter 19 will be starting up next week. Sorry for the longer breather, but I needed a little time off to get things ready and to enjoy a little bit of a winter break. Stay for Chapter 19, though. It’s gonna be a doozy.